A few days had passed since my selection in IPS and the giddy feeling was waning off when one day as I woke up, I saw my mother having a heated argument with someone on the phone. “It was one of your distant uncles. He was sharing his view about how you should have chosen IRS over IPS as it is not a service meant for women”, she said as she disconnected the call. We shared a hearty laugh; a good start for the day, causing another crack in the proverbial glass ceiling! As I moved into the service, I got acquainted with stories of discrimination and atrocities committed against women. Women ‘suicide’ after marriage is a real phenomenon. While causes might be many, there is no denying that subjugation of women to patriarchy does play a part in it. There was an incident where a woman was subjected to many threats whenever she was outdoors while the offender was roaming freely. When we received a complaint regarding this, we acted swiftly. My fellow officers were quick in lodging a report against the man in question but he remained unabashed throughout the proceeding. I saw similar attitude reflected in few other cases as well. It had made me aware of the some of the privileges I had enjoyed in my life; career oriented parents, open minded friends, non-discriminatory educational institutes and something I can confidently vouch for; a great policing environment with equal opportunities that IPS provided. Though not everyone in the society is lucky to have such privileges and my police days exposed me to this other side. But all of this is changing; albeit slowly but surely. In my opinion, patriarchy is a bane for both the gender. While it prevents a women to realise all the aspects of her life to full, it also puts a lot of pressure on men to prove their worth in this ever increasing competitive world. The aforesaid ‘glass ceiling’ is not the roof but it lies in the middle of men and women and equal efforts from both the gender is needed to bring it down. The cracks are many and it is growing weak but we should not forgo the success we have achieved. One instance in my service was particularly amusing. There is no denying that IPS, in its past, like the other services was male dominated. The recruitment of women in the service has improved significantly when compared to the past, but still some traditions remind us of the years past. One such was the peculiar way of addressing your senior women officers: ‘Madam Sir’. Every time I heard it, it did bring a smile on my face. Someday, people will find it apt to address the lady officers with just ‘Madam’. Someday, unabashed hooligans would be ashamed of their doings. Someday, the cracks in the ‘glass ceiling’ will be just enough to make it shatter. Let us try to bring that day together. IAS Officer Batch 2016, Former IPS Officer Batch 2012. 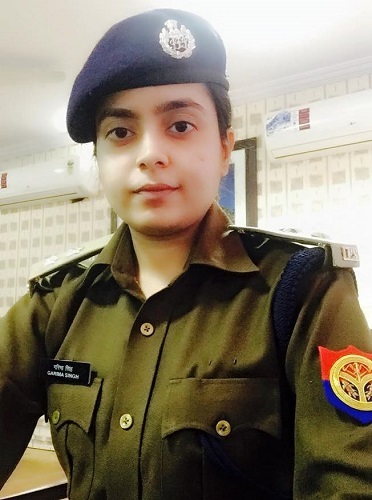 Served as ASP Lucknow, SP City Jhansi, SP Intelligence. Currently undergoing training for IAS at LBSNAA Mussoorie. MA (H) History, BA (H) History from St. Stephen’s College, Delhi University.